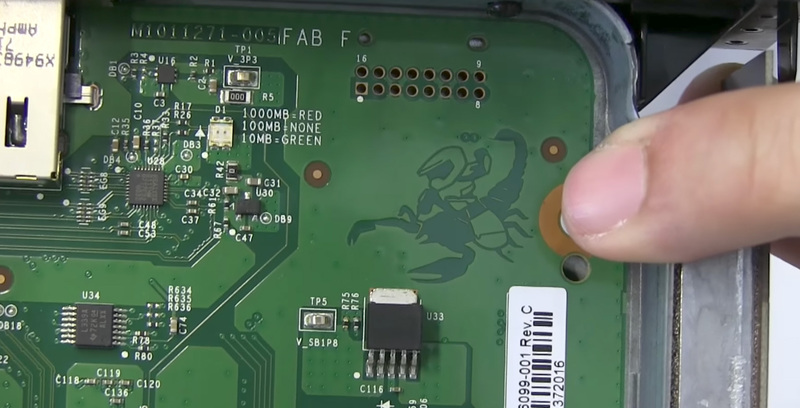 Similar to past video game consoles and accessories, Microsoft has hidden an amusing Easter Egg inside its upcoming Xbox One X console: an image of the Halo series’ main character, the Master Chief, riding a scorpion. Given the Master Chief and the Halo series arguably singlehandedly created Microsoft’s Xbox brand in the early 2000s, it makes sense for the tech giant to be paying homage to its most recognizable property. Most people will never see the surprisingly detailed etching though since it’s located on the console’s internal circuit board. This means that you’ll need to crack open the Xbox One X before it’s actually visible, voiding the systems warranty in the process. YouTube channel Unocero spotted the Easter egg during a recent tour of Microsoft’s Seattle campus (you can see it in the video above at about the 11-minute mark). iFixit also took apart the Xbox One X and snapped photos of the console’s internal hardware.